Dylan Mattingly by name. He's got a thing for Amelia Earhart, the famous pilot who disappeared 75 years ago near Howland Island in the Pacific. Inspired by the story of her last flight, Mattingly wrote a 40-minute work for chamber orchestra, "Atlas of Somewhere On the Way to Howland Island," as an homage to her and (forgive him the flight of words; he's just a kid) "for all those voyagers between horizons; for those -- past and present -- who have flown into storms, for those floating dreamscapes out beyond the curvature of the sunrise, for those that reach escape velocity, for when even your endless arms can't rearrange the constellations." A kid who's amazingly productive. Mattingly was a 19-year-old undergrad at Bard College when he began writing "Atlas"; 20 when he finished it. Now he's all of 21; he graduates next year. "Atlas" was first performed in 2011 at Bard and at Galapagos Art Space in Brooklyn by Contemporaneous, the chamber orchestra he co-founded with co-artistic director and conductor David Bloom, another Bard undergrad. The second movement "Islanded in a Stream of Stars," about 22 minutes in length, aired on WNYC on June 7, 2012. 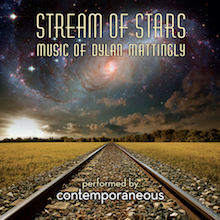 It's from the orchestra's debut album Stream of Stars, which also presents two other works of Mattlingly's, "Six Night Sunrise" and "Lighthouse."